I frequent these neighborhoods and establishments knowing that, with each visit, I will enjoy some of the finest people offering the heartiest of greetings and the richest of conversations. This is the real Atlanta. After unexpectedly relocating to live with his uncle, Dr. C. Clayton Powell had no idea what kind of life awaited him. Atlanta was a new neighborhood with new rules, and if he wanted to rise to the top, it would take more than his trademark “conquer-the-world” confidence to make a difference. With an indomitable spirit, Dr. Powell took to the challenge and made a name for himself that others would not soon forget. Each step of his journey was punctuated by the hard work and dedication that became synonymous with his brand of success. 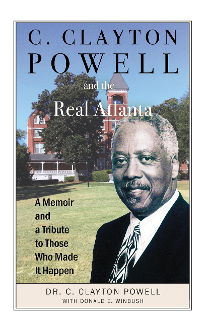 From World War II through the civil rights movement and on, Dr. Powell weaves his story with that of Atlanta and the enduring black community at its heart. In these pages, discover the Atlanta of yesteryear and the living history of those who made it happen. With warmth and sincerity, Dr. Powell invites you to explore the real Atlanta.